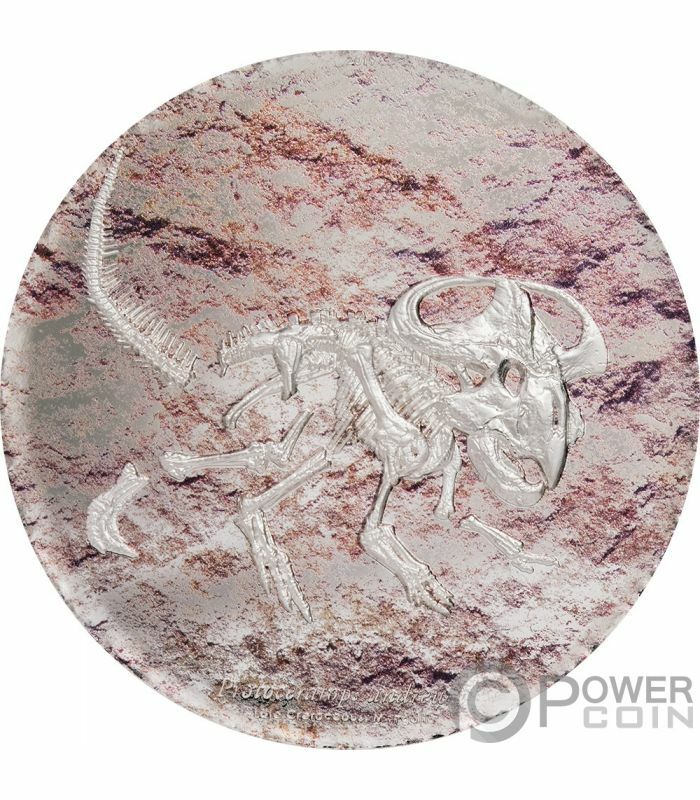 This beautiful 3 Oz Silver coin is the second release in the new “Prehistoric Beasts” series featuring some of the world’s most fascinating Beasts. In this edition – the Protoceratops. 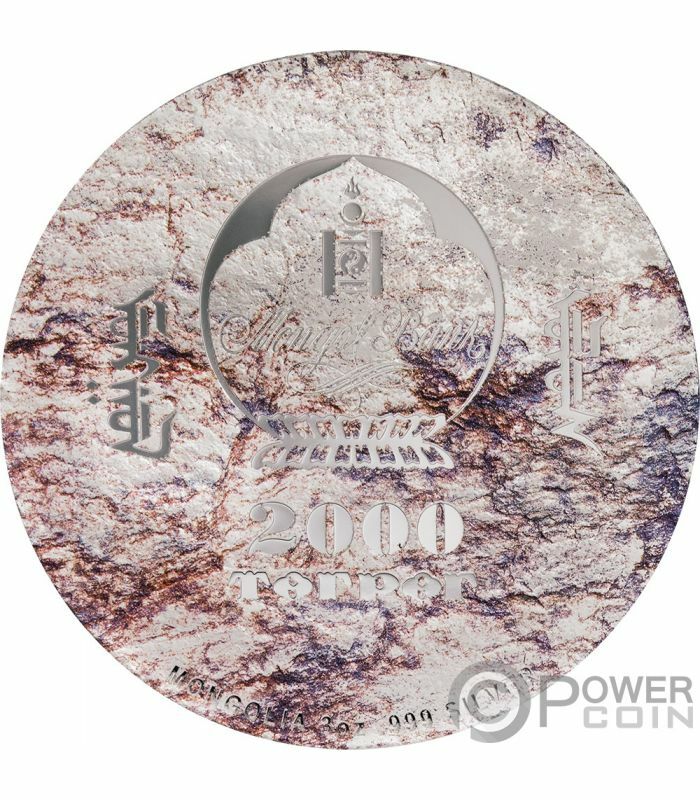 The coin features the Smartminting technology, has a wonderful red-rock finish and comes in a display case, along with the Certificate of Authenticity. Limited mintage of only 999 pieces worldwide! Protoceratops is a genus of sheep-sized (1.8 m long) herbivorous ceratopsian dinosaur, from the Upper Cretaceous Period (Campanian stage) of what is now Mongolia. It was a member of the Protoceratopsidae, a group of early horned dinosaurs. Unlike later ceratopsians, however, it was a much smaller creature that lacked well-developed horns and retained some primitive traits not seen in later genera. Protoceratops had a large neck frill which was likely used as a display site to impress other members of the species. Other hypotheses about its function include protection of the neck and anchoring of jaw muscles, but the fragility of the frill and the poor leverage offered by possible attachment sites here makes these ideas implausible. Described by Walter W. Granger and W.K. Gregory in 1923, Protoceratops was initially believed to be an ancestor of the North American ceratopsians. Researchers currently distinguish two species of Protoceratops (P. andrewsi and P. hellenikorhinus), based in part by their respective sizes. In the 1920s, Roy Chapman Andrews discovered fossilized eggs in Mongolia that were interpreted as belonging to this dinosaur, but which turned out to be those of Oviraptor. 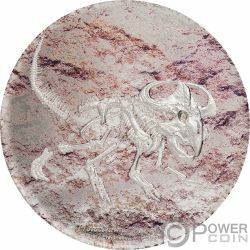 The reverse of the coin replicates what it seems to be the archaeological remains of a Protoceratops, over a red-rock finished background. On the bottom of the reverse, the inscription: “Protoceratops Andrewsi” – the name of the coin. 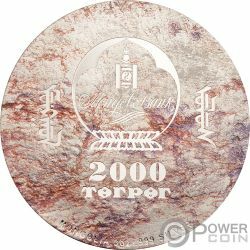 The obverse of the coin depicts the Mongolian Coat of Arms and the inscriptions: “2000 TOGROG” – the face value, “MONGOLIA” – the issuing country and “3oz .999 SILVER” – the weight of the coin and the fineness of the Silver.